TUPELO – “Emails from Heaven” is not an easy book to read. But the truth is, life isn’t always easy. From the opening pages, you learn of a devastating diagnosis and you know immediately it’s not a diagnosis that’s destined to be defeated. Also from the very beginning of Keith Merritt’s book, you are unable to put it down, no matter how badly tears may be blurring your vision. Through his words, both tender and unabashed, Merritt makes you care for his family. I began reading “Emails from Heaven” before leaving Hattiesburg last Sunday. My friend Cheryl was driving us back home to Tupelo, so I read aloud. Our rest stops were taken reluctantly and kept brief because we did not want to be long away from one family’s story. Merritt has taken emails he wrote during his wife Gayle’s courageous 11-month battle with pancreatic cancer and written around them the heart-warming story of their meeting as toddlers, later dating, marrying and having a family. He also writes about his own anger at health care and insurance issues he fought during the course of Gayle’s illness. A kind soul, Merritt does not fail to also write of his gratitude to the doctors and other care givers who got things right. He and I have in common a deep, life-long appreciation to the people who make Sanctuary Hospice the amazing organization it is. If you’ve had struggles of your own – or are struggling now – and are feeling alone or without hope, give the gift of this book to yourself. The faith of Keith Merritt and his family – and their abiding belief that God was with them always – will lift you up. Even if life’s easy for you right now, reading about Gayle Merritt’s ever-present smile and enduring joy will prompt you to count your own blessings. 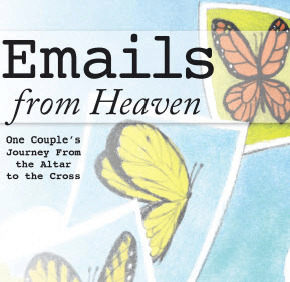 When we finished reading the final page of “Emails from Heaven,” my friend Cheryl turned to me with tears in her eyes and said of Gayle Merritt, “I feel like I’ve lost a dear friend.” Though we’d never had the privilege of meeting her, I felt the same. Thanks, Keith Merritt, for introducing us to such an amazing human being. And for sharing your family’s endearing story. Reprinted with permission from the Northeast Mississippi Daily Journal. To order this book, click here.